Remember when I found this colander marked solid copper, made in Korea? I had not found a place for it yet. 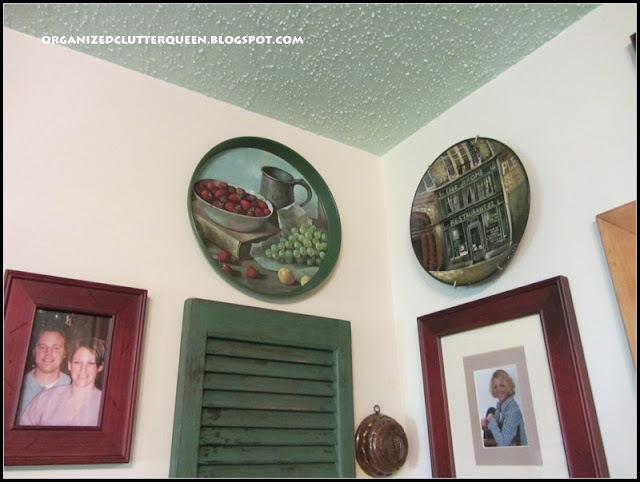 This photo, from my kitchen reveal post, shows a dark red, metal, country colander hanging in my kitchen. I purchased it a while ago at a local drug store. It was for decorative purposes only, and had a star pattern on the bottom. I swapped out the country one with the copper colander. I think it has a much more French country look! I just found this colorful round tray this week at an antique store. I think it may match my green shutter in the kitchen. This is the corner that I am planning to hang the tray in. There's the green shutter. 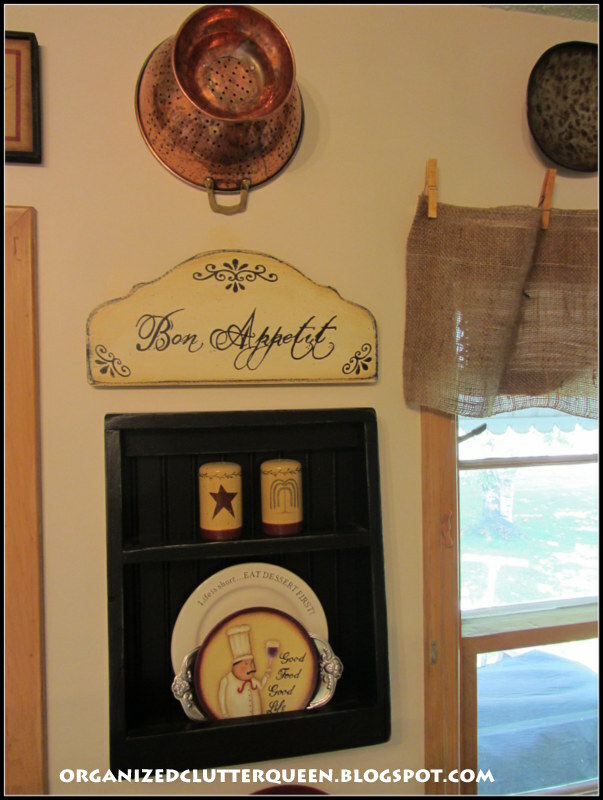 I am thinking about taking the star down and putting the Paris plate in its place and the tray above the shutter. I like the new tray! I raised the green shutter up a little higher on the wall. 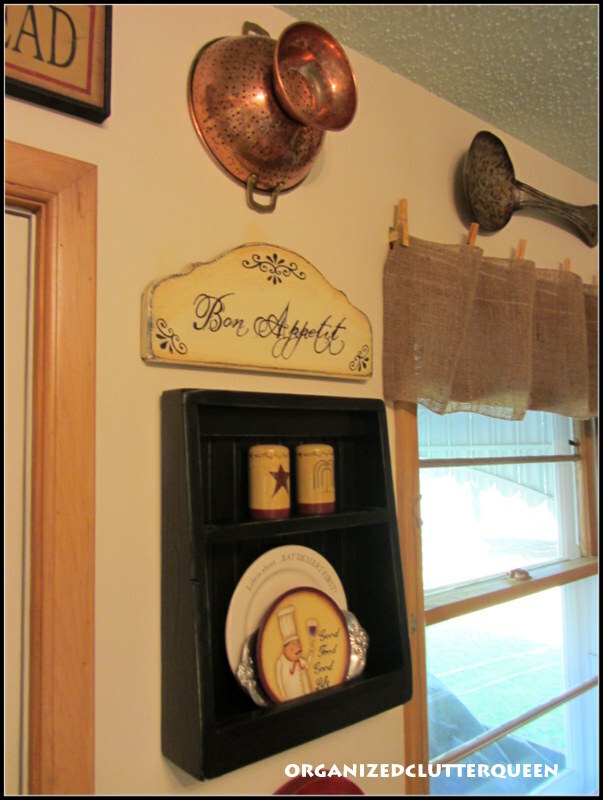 I also added my vintage, Progressus french fry cutter to the vignette. I guess I'm done re-arranging for today! I think the tray looks fantastic with the shutter! 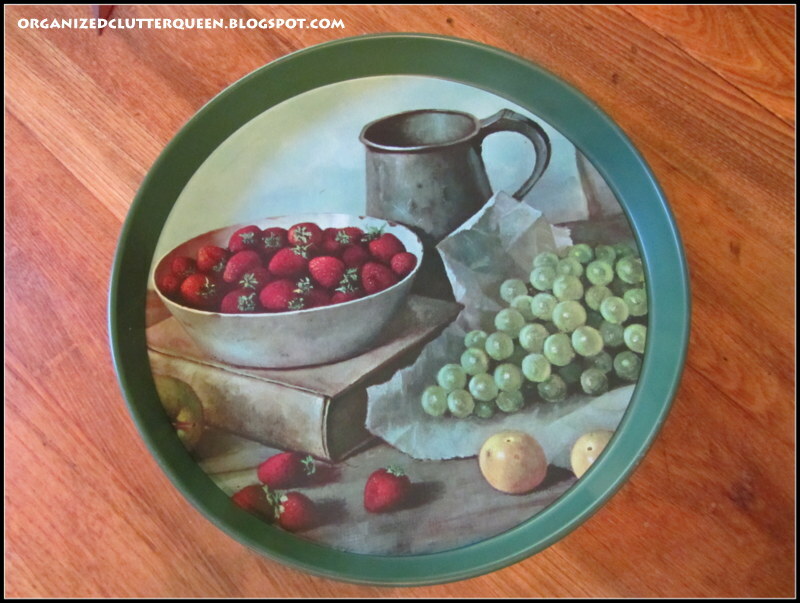 Yep, the tray looks perfect with the shutter and the colander looks perfect in it's spot! I'm thinking I need to find a shutter! And a colander! Have a terrific weekend Carlene!! Everthing looks great! 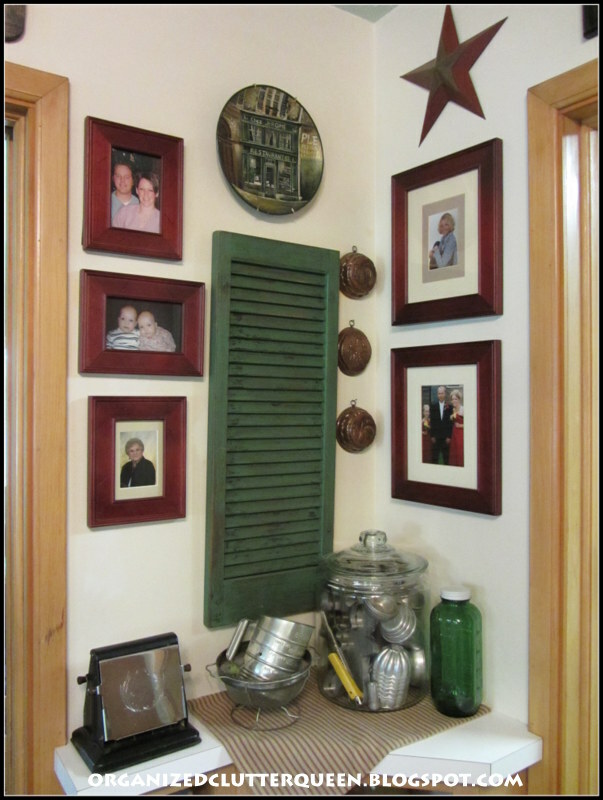 I love the copper colander and the green tray just works perfectly with the shutter. I love using Shutters it adds so much charm to any space. Your new arrangements are wonderful . 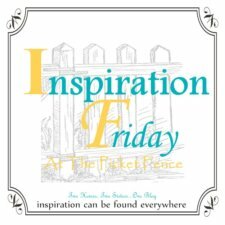 Thank you for inspiring me.. I love your tray too! Placing it above the shutter was a wonderful idea. It looks great! I like the changes Carlene. Cute, cute organized clutter! lol! 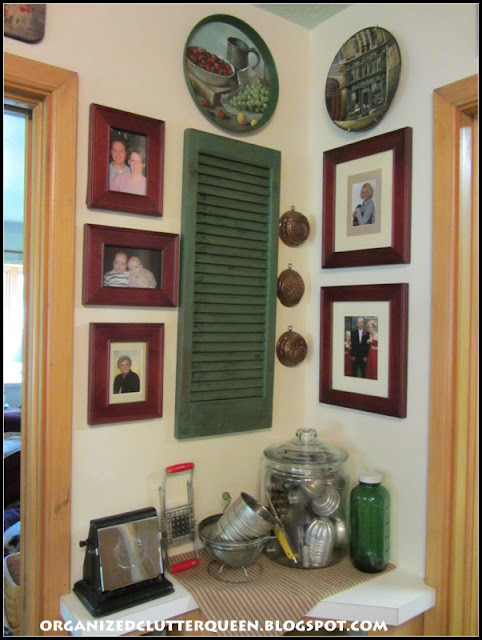 love that tray and it goes perfectly with the shutter ; in fact everything looks perfect ..
Love it, the corner looks so great! It's always fun to change things around. 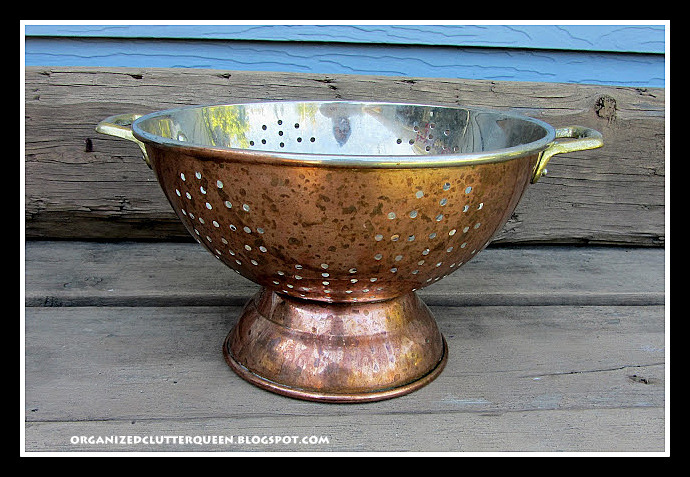 Your copper colander is beautiful. I used to have that same tray. 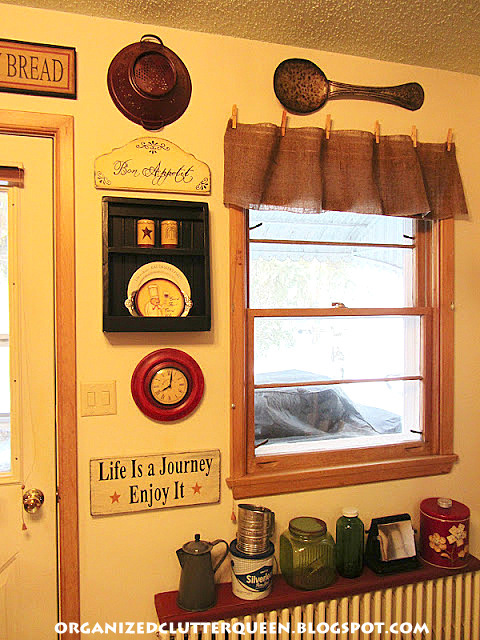 Yours looks great hanging above the shutter. Maybe you can send your star on a brief vacation and bring it back twined with twinkle lights in December. How did you hang the burlap valance? Clothespins on a cafe rod.